We've made some big improvements to the way email hooks work and the information provided in the alerts that will make it easier to identify why your API tests are failing and to keep issues about your service prioritized with grouped alerts. Alerts are sent once per test run and will include multiple tests (if applicable). The email contains all of the tests in the run and will highlight common failures between tests. If you were already using Assertible's email alerts, number one above will be an immediately noticable improvement. 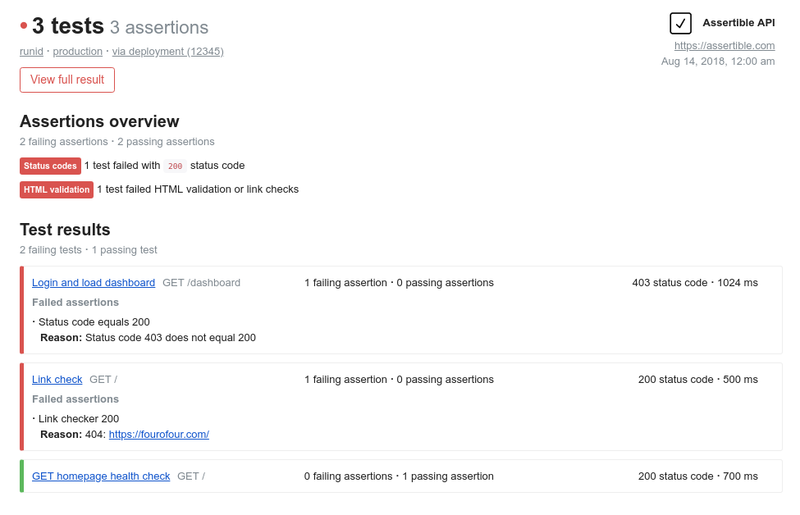 Consolidating the API failure notifications into a single email keeps the noise down for your team, while the updated emails provide more information to quickly determine the cause of an issue. All existing email hooks are automatically updated so you don't need to do anything specific to take advantage of the new behavior. Feel free to reach out any time if you have questions setting up the email hooks or have any feedback on the behavior. As we continue improving Assertible's underlying notification system in the coming weeks, we'll be moving these changes to also apply to Slack alerts and other automation, so stay tuned for updates on those! We love to talk about what works and what doesn't for your use-case and what we can do to make Assertible better for testing your API. If you have any thoughts or ideas about the new features, send us a message, reach out on Twitter, or open the chat box on this page!